Why Not Download The Last Issue Right Now For Free? 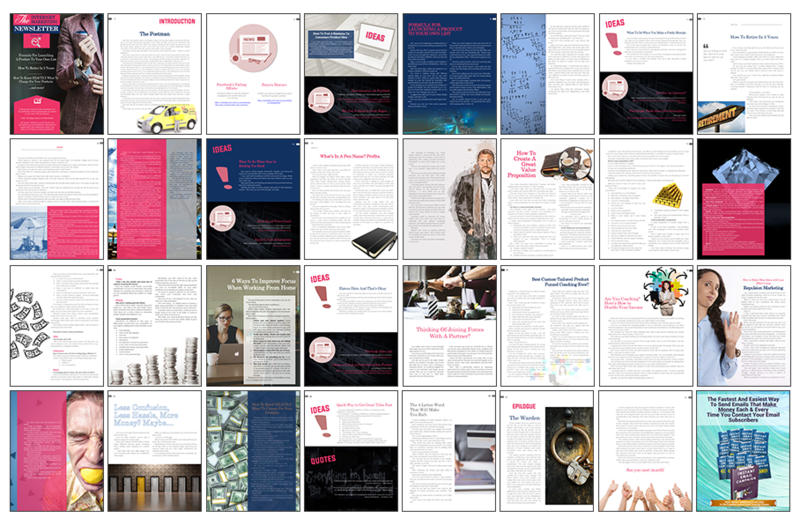 You should judge the quality of our monthly PLR writing service by actually reading the last issue of the Internet Marketing Newsletter for yourself. Don't just take our word for how good it is, make up your own mind. Simply enter your name and email below to get started. Your Biggest Headache Has Just Been SOLVED! If EVERYTHING Ghost Writers Wrote Actually Worked, They Would Be Successful Internet Marketers - Not Ghost Writers. But... Ghost Writers Are NOT Internet Marketers. When You Can Hire Me To Create Hot New Money-Generating IM Content For You...? Join me today and you'll immediately get over 32+ pages of current, up-to-date pure Internet Marketing content that contains an Introduction, all the Latest News, internet marketing Ideas, cool Resources, an Epilogue - Feature Length Articles and ADDITIONAL Exclusive pull-out-supplements all in one place, each and every month. IMPORTANT: This is NOT rehashed or crappy old PLR content – This is professional, timely, relevant content which will keep your readers' attention and keep them coming back for more! You Can Use The Content For Articles, Emails, Blog Posts, In E-books, E-courses, Podcasts, Videos Etc. - Anyway You Choose, You've Got Full Written Permission! Do you ever feel like you're juggling too many balls... Or running too many projects? Does it feel like you can't get everything done and there's just not enough hours in the day to make any real money online?... I mean where the heck has your Internet Marketing lifestyle disapeared to? However it doesn't have to stay that way. You are about to discover (just by reading this web page) several powerful strategies that you can implement immediately to stop being so overwhelmed with everything that needs to be done. And it doesn't matter whether you are a complete newbie, been struggling for a few years or even if you are a superstar in the IM niche, I can help you. But first, just so we're both on the same page here, let me share with you something that all successful entrepreneurs agree upon. ...instead of working ON your business. Architects don't actually build buildings – they have workers who do that for them. Chefs don't chop vegetables or clean the kitchen – they have workers who do that for them. CEOs don't actually make and sell products, perform services or answer phones – they have workers who do that for them. The #1 biggest reason online businesses fail is because their owners spend all their time doing the 'grunt' work instead of focusing on how to build their business. You will never become a 6 or 7 figure earner online until you start delegating – or outsourcing – the majority of your work. There are not enough hours in the day to do everything a successful online marketer must do. And one of your jobs as an online marketer is to publish great content on your websites, your blogs, in your emails, in social media, in your products and so forth. If you're trying to do it all by yourself, you're going to struggle. As well as forfeiting countless hours researching and writing articles during evenings and over weekends or perhaps even working late into the night most nights... You should either be enjoying time with your family and friends (which is probably the reason you started your online business in the first place) or if you are 'truly addicted' to your online business like most of our existing customers, you should be planning and working on your next 6-figure product launch! When you think about the amount of time and energy it takes you to generate fresh new content compared to the amount of money you create making and selling new products... 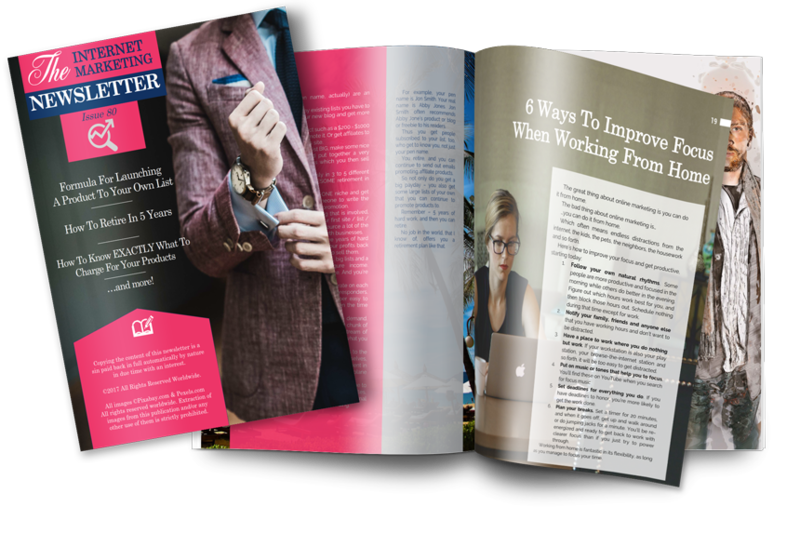 It's a no brainer – You've got to get some help producing your eZine, newsletter and blog site content.... and the sooner you do it the faster you can increase your income. Your First Choice - You can outsource the work to someone. Go to Upwork, Freelancer or any of those other sites and search through the writers. Eventually, after weeks or months of trial and error (and some wasted gigs), you will find someone suited to do the job - maybe even several people. The next step is to now train them to write great online content for you. And expect to pay them at least several hundred dollars a month each, if not more, as you continue to teach them what you want them to do. Your Second Choice – The choice which all 'the smart marketers' make when reading this page. Let me handle your new IM content creation for you. Without any hassels whatsoever. Remember I make my entire living not by writing about Internet Marketing, but by actually DOING it. Imagine being a total hero to your readers, subscribers, prospects and customers. And imagine being the authority they look to for the latest news and techniques of Internet Marketing. Together with our in-house design team, we're going to be working over-time to make you look like a star to your audience. They'll never know that all you do is put your own name on the cover and nothing else. You do none of the research. You do none of the writing. Together with my designer, we'll do it all for you. Here's A Promise: You will personally discover more about Internet Marketing while reading one issue of our newsletter than you'll ever get buying 5 eBooks from Clickbank. Outsourcing: This is the key to making millions, yet most marketers get it totally wrong. Here's how to use outsourcing to make your first 5, 6 and eventually 7 figure incomes. JVs: Scared to death to do JVs? Think you don't have anything to offer? Guess again! Here are over 20 methods to get JVs with almost anyone. Niches: 50 niches that are just begging to be exploited. We're talking low competition and high profits. Webinars: The step-by-step system anyone can use to host profit-pulling webinars – even if you don't have anything to sell and you hate speaking! Podcasting: Don't just do any old podcast – design yours to become a non-stop money maker with these 25 little known techniques. You get the NEWS and latest hot RESOURCES AND HOT IDEAS all related to Internet Marketing. In A Professionally Designed PDF Format. Or simply edit the default content using MS Word to fully rebrand everything such as changing the title or adding your domain name as the publisher. You get the content for creating your own publication: over 32+ pages each and every month of pure Internet Marketing oriented content, categorised as displayed in the image below. PLUS with our no-nonsense Private Label Rights, you can pretty much use the content in any way you desire - Use your newly written content for Articles, Emails, Blog Posts, In E-books, eCourses, Podcasts, Radio Shows, Videos Etc. (Just please read the full Ts & Cs in our FAQ section so you know what's not covered) - In 99.9% of all cases you're covered! You also get a ready to be distributed PDF ILLUSTRATED newsletter full of the monthly content, so you can deliver it AS IS to your subscribers. Now You Can FINALLY FOCUS On More Important Aspects Of Business Building Than Creating Outstanding Content! As a special bonus, join today and you will also receive the most valuable extra bonus I have ever published. The answer can be found within these pages as they contain copies of all my sales letters dating back to 2001. Together they helped me to bank a whopping $14,547,652.36 since I began my little online business. In fact just ONE of the sales letters included gave me a 7% conversion rate to a cold mailing and went on to sell 4,600 copies of a product at $143.95 – You work out the math on that! Including Copywriter Notes: Plus hand written on each page are my personal copywriting notes as to “why” I wrote the copy the way I did and “what” the sentence was trying to achieve. This is really powerful stuff. The Unfair Advantage Swipe Files sell on another website for $497 (you can check here). But right now you can get them COMPLETELY FREE when you take out a $1 trial membership to the Internet Marketing Newsletter PLR service TODAY. You will get the written permission to re-publish, re-purpose and re-use the sales copy inside the Swipe Files for ANY of your own projects. However you cannot pass these rights along to anyone else. They are just for your use. One final point I should make about these sales letters… When I started marketing, I used direct mail. EVERY WORD had to count. I trusted these letters to return some serious investment in printing and mailing the traditional way. They worked. They worked then and they will work today. They are worth their weight in GOLD and printed out they weigh nearly 9lbs. I reserve the right to remove this Mega Bonus at any time. You'll be able to access the current issue complete with full PLR rights, together with the 'ready-to-go' designed PDF Newsletter instantly! Whilst we are now nearing the bottom of this webpage, I hope that we are at the very beginning of a long and rewarding business relationship together. Nick, thank you! I have been an active member of your Internet Marketing PLR Newsletter and I absolutely LOVE IT! It’s presented in such a professional manner and the content is first class. As a Marketer of 13 years, I’ve seen so much information being branded as good quality with private label rights (PLR), and I must admit that nothing has risen to the high standards that I require, until now. The information contained in your Newsletter and the format is second to none. I love the fact that as part of the package I am given your newsletter in MS Word format so I can repurpose the information for my own members and marketing. I use your newsletter every month, add my own logo and put my own spin on things. Then I send it to my email list, add to my blog and watch the positive responses come in. This is key as you know. If you can send quality to your following then you’re already winning. However, the stumbling block for most is where to start and what to send out. Your Internet Marketing Newsletter addressed this and more! Again, Nick thank you for your vision, professionalism and for sharing your wealth of knowledge with us all. I didn't want to write this testimonial because the newsletter is my secret weapon. "They say if you want to achieve results then find people who have already done it and model them. This is what makes this newsletter so great. The content that is written is by an expect in the field so you get tried and tested insights, methods, knowledge and processes. This content is great as it can be used to help your customers and clients but indirectly raises your own creditability too because it contains information that works. Finding the time or team for content creation can be tough when running your business but anything that makes any part of that easier is a no brainer. It's trusted content and created by someone who implements it them-self. Nick leads by example and is a genuine internet marketer. I didn't want to write this testimonial because the newsletter is my secret weapon. But deep inside I also know that its information that will guide you well and thats more important then my ego." I bought the Internet Marketing Newsletter PLR Service, and have to say that i am very happy! Love your newsletter - you provide a lot of great information without overload. I'm loving the newsletter, it's by far one of the best monthly PLR writing services in the IM PLR space. It saves me so much time and my own customers love it too. Congratulations Nick for being at the top of JVZOO, well deserved. Your newsletter PLR is top notch professionally created. I love it and your recent offer has inspired me to get back into the business of Internet Marketing, using your content as a base for getting going again. I will keep you in the loop as to how I am doing if you don't mind. Nick James is an entrepreneur that cares. His website has some of the best Internet Marketing resources on the Internet that I have found to date. Also his introductory gift of two DVDs and a properly printed book (sent by post) are excellent. I am learning a lot from Nick but have hardly touched the surface of all the knowledge contained in Nick's website. In fact I have started building my own websites using Nick's methods. Although Nick emails regularly (his Weekly Tip email is superb) I don't get constantly bombarded with emails promoting every offering all the other marketers send every day. Life is to short to spend time looking for free information on the Internet; If you invest in Nick's website training, you will more than save the cost in time by having most of your resources readily available in one place. I would recommend anyone with an interest in making money on the Internet to invest in the Internet Marketing Training Club and follow Nick's methods to become wealthy. The internet membership site provided by Nick James..... Well where do I start?.... At first, to be honest, I didn't see the importance, I really didn't..... what a mistake may I add. It's vitally important, especially for new entrepreneurs that need a safe haven or focal point to turn to or need access to information they can turn to at anytime and ask question continuously at anytime. Feed back is very quick. The Members' Discussion Forum is vital to your growth as an entrepreneur especially when you're just starting. You need to be able to access information quickly and hear what more experienced entrepreneurs are doing. I think Nick is an amazing mentor, educator and presenter. He comes across as someone who is really passionate about everything he does. His Team is quality and hope to work along for a long time. Nick's personal story is highly motivating and he fully appreciates the need we all have to be motivated. Membership of the Internet Marketing Training Club is a very valuable resource for anyone seeking to build an Internet Marketing business. Nick is tireless in developing new ways of making money on line and helping anyone who wants to put in the effort. In the short time that I have known Nick, I have been very impressed with his service. As a member of his Internet Marketing Training Club, the Articles and Tutorials are excellent information to put into practice. Nick has always replied to my emails within a couple of days and Nick is an honest straightforward guy and I am please to be part of his group. After many false dawns the light is now firmly on. There is so much clear and timely detail that by asking questions and heeding the helpful answers it can only be a matter of time before the sales begin. They surely will. Thanks Nick. 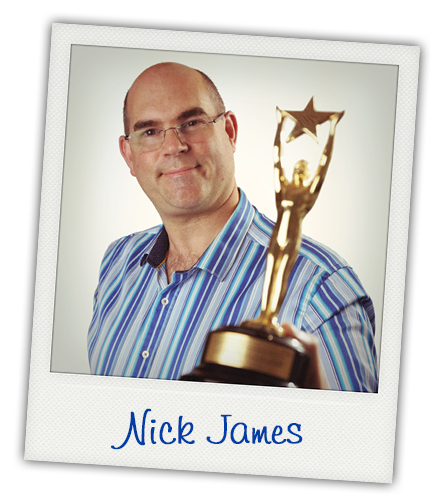 I have been lucky enough to be under the tutelage of Nick James and Co. for just over 3 months now and after being initially cautious about "on-line get quick rich" schemes, I have to say that I am "blown away" by the vast amount and quality of information that is supplied constantly to the investors in this programme and beyond. I have personally met Nick and Kate and also some of the other contributors to this business programme and they are REAL, approachable, very professional business people and will bend over backwards to help every student. Even if you already have your own business or if you want to start your own business then don't sit on the fence a second longer. Contact Nick and demand to be his next student. I have met Nick's mentor Andrew, and I can see why Nick seized his opportunity all those years ago and decided to follow in Andrews' footsteps to GENUINE wealth. I have now followed in Nicks footsteps. All the products you have recommended or produced, that I have seen or used to date, are comprehensive and professional and I would recommend them. I found each section of the Affiliate Commission Game Plan very clearly explained and I will find it a very useful training tool. Communication with you and Kate is fine and I enjoy working with you and attending the Workshops and Webinars. The problems with the internet signal sometimes, however, causes some frustration. I started in search of making money in the internet. All I came across yield me nothing. I always hear that to succeed in the business you need a mentor. I came across Nick James and he has changed my thinking and feeling. All that I had from Nick has made me to know that I am in business. Anything he say he does it. I cannot praise him much for now but will recommend him to anyone who wants to do business. Thank you so much Nick for creating this software! It is awesome. Very easy as long as you follow your instructions to the letter. I have transformed my site and rejuvenated it. Now it looks really professional. This software is priceless! Thank you for giving it away FREE with the membership to the IMTC.